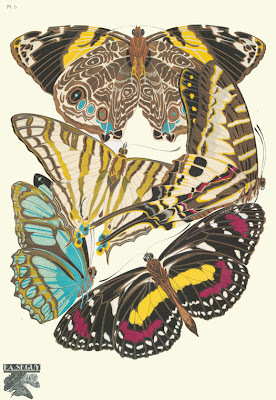 Way back in April 2007, I mentioned some images of Séguy butterflies found in an ornament and pattern collection belonging to The New York Public Library archives. 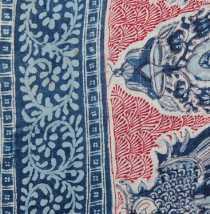 These are included in the library's vast online digital gallery along with old textile designs, historical maps, vintage posters, rare prints and illustrated books. Reproductions can be ordered as framed or unframed prints, starting at $30. So of course the E. A. Séguy works used above in this striking bedroom from domino's June '08 issue caught my eye right away as I flipped through the new magazine. I'm in love with the juxtaposition of bold red upholstered headboards against soft, icy-blue walls, not to mention the graphic striped rug. Kudos to the stylist! And heartfelt congratulations to Rubie Green founder, Michelle Adams, (and "my" chevron chair fabric "East Village") for making the issue too. Initially I wanted to mention the Andy Spade and Anthony Sperduti short film for J Crew, The Exchange. But I figured it would be all over the blogosphere by the time I got to it. So instead, I'm drawing attention to Sir Winston Churchill's painting, Marrakech, given to U.S. President, Harry S. Truman, in 1951. Enamored with Morocco since the 1920s, Churchill had some moving experiences there in the desert during World War II. After the Casablanca Conference of 1943, Churchill persuaded Franklin Roosevelt to make an arduous journey to see the wonder of the sun setting over snow on the Atlas Mountains. 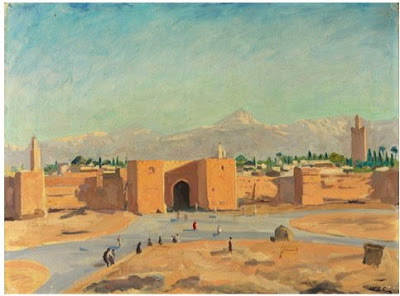 A passionate painter, Churchill captured the scene and later in the 1940s depicted other Moroccan landscapes. 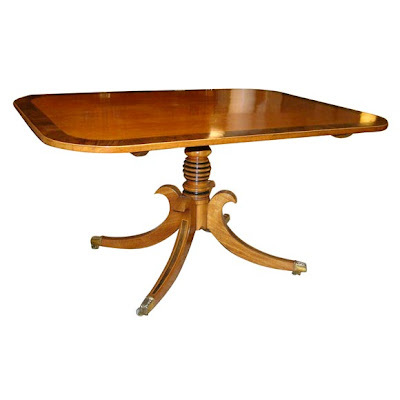 The gift to Truman was auctioned by Sotheby's in December 2007. 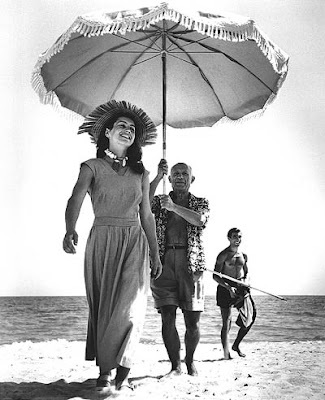 First, to get in the mood, it's time for the annual posting of two of my favorite summer images: Robert Capa's famous 1948 photo of Francoise Gilot and Pablo Picasso in sunny Golfe-Juan, France, (that's Picasso's nephew, Javier Vilaro, in the background) followed by designer Bonnie Cashin's "graffiti wall" circa 1962. 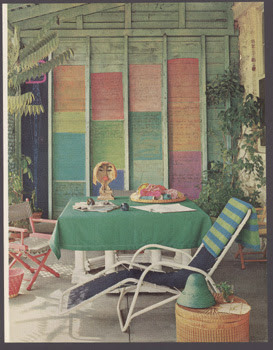 In all of her homes Cashin created a wall like this to display quotes from her favorite intellectual heroes, such as Einstein, Ghandi and Picasso. In recent years, some designers have said that decorating with shells is overdone. 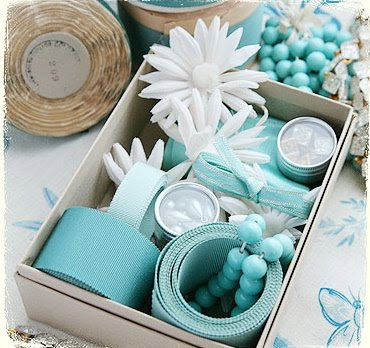 But others feel shells are just a natural element, like fresh flowers, that always enhance a room. 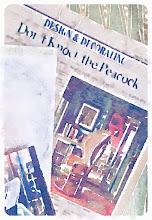 In an old book from 1992 (House Beautiful Decorating Style) I spotted this starfish casually propped by stylist Sarah Shaw on a wall with varied art, and for a few summers I copied the idea. To keep my starfish in place, I even purchased a special removable wall adhesive invented for renters. 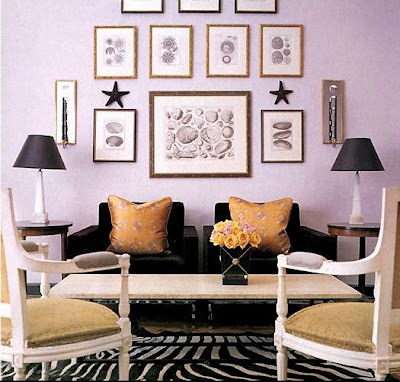 Schuyler Samperton's take on the starfish -- a tiny starfish -- as seen in Elle Decor, November, 2003. Here, a classic tablescape in a Billy Baldwin-designed villa in Mallorca. 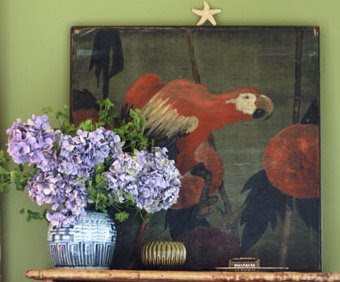 The homeowner, Mrs. Gilbert Miller, has in her living room a guest book surrounded by personal objects: shells, an ostrich egg, summer flowers and a framed seascape. Image circa 1971. Cabinet doors used as inspiration boards are nothing new. 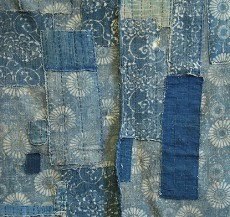 Usually, though, this is done on craft room cupboards or more utilitarian office cabinets. But architect Piero Castellini Baldissera opted to get creative with a chic, Chinese-red cabinet prominently on view in his Tuscan living room. Ribbons tacked to the doors hold personal photos and sketches. Adding to the effortless Old World glamour is the collection of beautifully bound vintage issues of Country Life nestled in with more pictures and collected objects. Placed on top are are old architectural instruments. 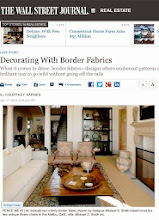 This cabinet is featured in Caroline Clifton-Mogg's Decorating with Antiques. 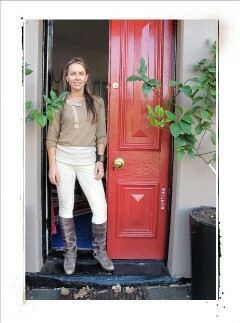 You may remember from a past post that Charlotte Moss has her collection of Vogue magazines hand-bound in red leather. Photo via New York Social Diary. Sorbonne-educated gallery owner Timothy Tew seems to be one of those fascinating guys who is equally at home in Paris or Georgia. Case in point: his 90s apartment on Myrtle Street, a four-room residence inside a languid looking old circa 1910 clapboard, located within walking distance of Atlanta's dynamic High Museum. If I had not mentioned the decade, could you date his interiors? With a mix of hand-me-down antiques, vintage finds, and of course salon-style groupings of art, they look rather timeless to me. 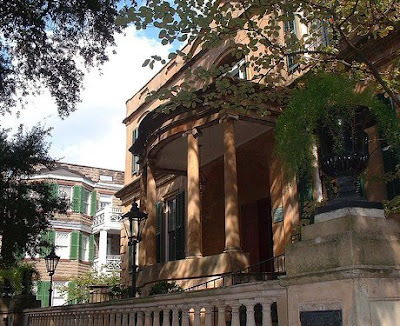 In her book, Atlanta at Home design journalist Frances Schultz quotes Tew as saying, "The South gave me an appreciation for gentility and beautiful things. There is a certain aesthetic here, and an appreciation for tradition, that I respect without being restricted by. 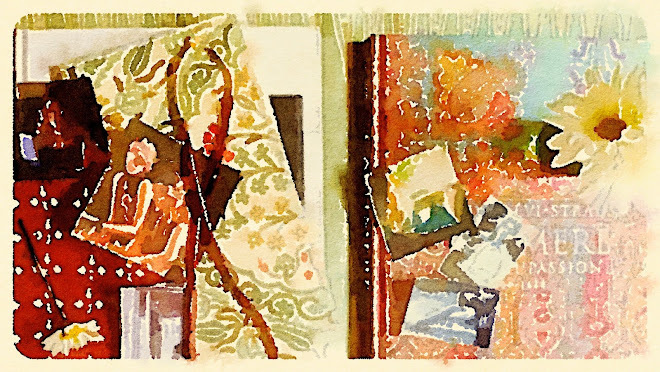 And then living in Paris influenced me a great deal..."
All images are from Atlanta at Home, Wyrick & Company, 1994. 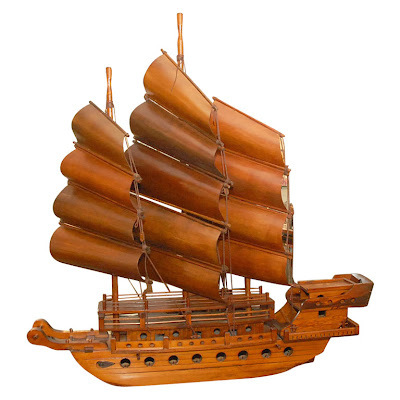 Thomas over at Antiques Du Monde currently has in store the ultimate Father's Day gift for a nautical dad: a 1940s handcarved Chinese-style junk with three bentwood sails. 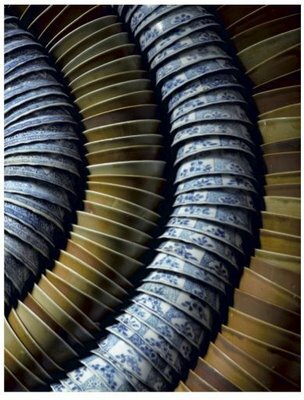 When I saw it, for some reason I was reminded of a past post about the Ca Mau shipwreck and Sotheby's 2007 auction of fine 18th-century porcelain recovered from the South China Seas. Click here for video about the recovery effort and the wares that were found. See also Sultan's Lost Treasure. 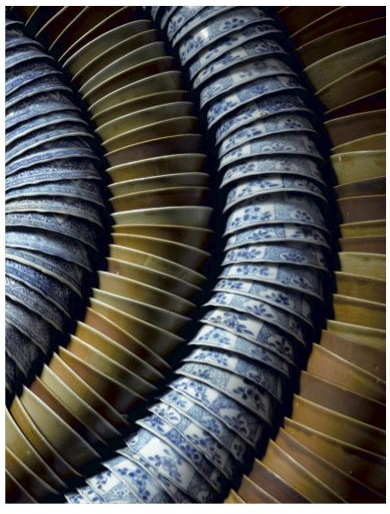 Portrait on mirror glass and image of stacked china copyright Sotheby's. 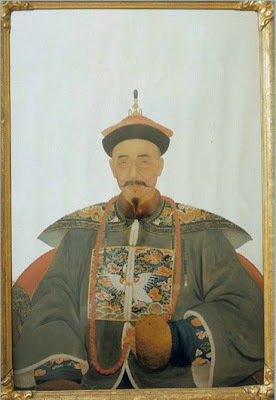 Shown at top, Pan Qiguan, head of the most successful family business in the history of the Canton junk trade. If Hollywood Regency is a trendier look that has swung in and out of favor since the 1930s, "original Regency" is a constant. 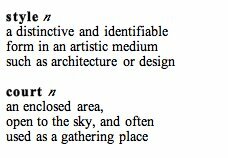 The chairs, chests, tables -- and architecture -- associated with England from 1790 to 1840 never really go out of style. 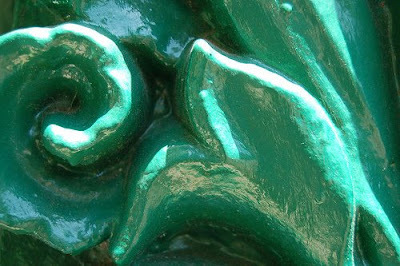 Named for the flamboyant Prince Regent, the period was highly eclectic. This was Jane Austen's era. 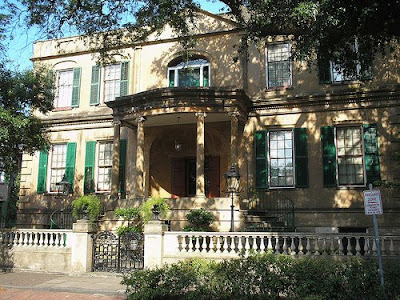 Styles most closely linked with English Regency -- Neoclassical, chinoiserie -- reflect a time of new archaeological discoveries and British colonial outposts in alluring "exotic" locals including China and India. 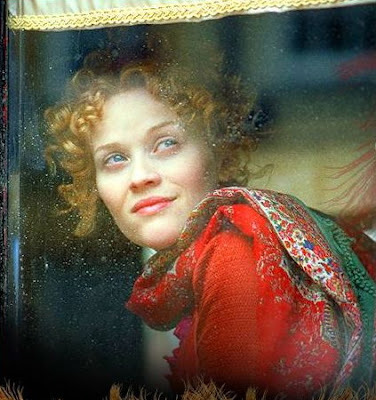 In her Regency-era film, Vanity Fair, Mira Nair emphasized the English taste for all things Eastern with rich sumptuous colors and patterns. This Asian-inspired red chandelier, recently spotted at the chic shop Max & Company, has a decidedly Regency feel. 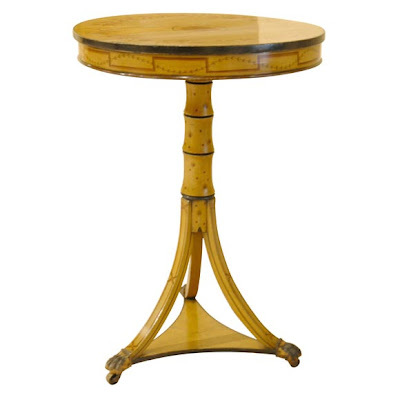 The period English Regency breakfast table above is available through Joe Nye and the smaller painted pedestal table is from Deadwyler. With photography by Francois Halard and text by garden expert Christian Duvernois, Marie-Antoinette and the Last Garden at Versailles looks like a must-add to the 2008 holiday gift list. The book is reported to be a refreshing departure from usual coverage of the queen, focusing on her private realm and passion for horticulture. 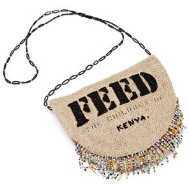 Scheduled release is October, just in time for giving. Here's a sneak peek. Photography copyright Francois Halard, Marie-Antoinette and the Last Garden by Christian Duvernois, Rizzoli New York, 2008. 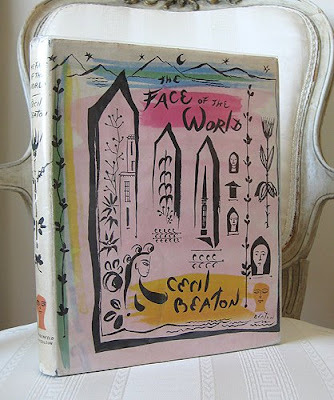 Just in at Paris Hotel Boutique: a first edition of Cecil Beaton's The Face of the World: An International Scrapbook of People and Places. Included are his portraits, sketches and photo-documentary images of numerous legends -- Audrey Hepburn, Karen Blixen, Camus, Sartre, Picasso -- and of his home Ashcombe. For years I've seen Beaton books in the background whenever Lynn von Kersting's home is photographed. 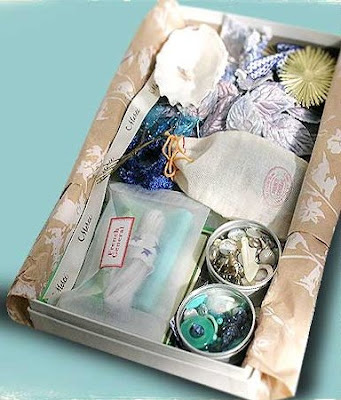 The "Scrapbook" is definitely on my wishlist. George Michell's The Majesty of Mughal Decoration was one of my favorite releases in 2007. 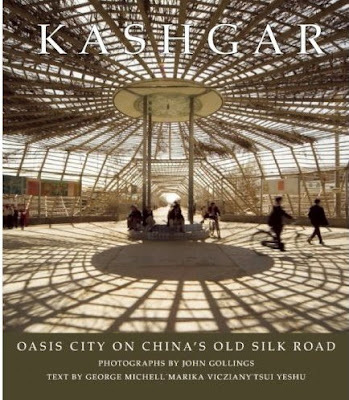 So I'm eagerly awaiting his next book, Kashgar: Oasis City on China's Old Silk Road. Today Kashgar, located in China's remote western area, is the site of what some call the best Sunday market in the world. Historically it was a pivotal spot along the the famed Silk Route. Click here to learn more.